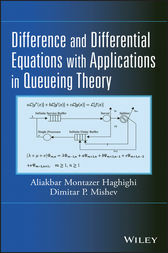 Difference and Differential Equations with Applications in Queueing Theory presents the unique connections between the methods and applications of differential equations, difference equations, and Markovian queues. Featuring a comprehensive collection of topics that are used in stochastic processes, particularly in queueing theory, the book thoroughly discusses the relationship to systems of linear differential difference equations. The book is an excellent resource for researchers and practitioners in applied mathematics, operations research, engineering, and industrial engineering, as well as a useful text for upper-undergraduate and graduate-level courses in applied mathematics, differential and difference equations, queueing theory, probability, and stochastic processes. ALIAKBAR MONTAZER HAGHIGHI, PhD, is Professor and Head of the Department of Mathematics at Prairie View A&M University, as well as founder and Editor-in-Chief of Applications and Applied Mathematics: An International Journal (AAM). Dr. Haghighi's research interests and publications are in the areas of probability, statistics, stochastic processes, and queueing theory. DIMITAR P. MISHEV, PhD, is Professor in the Department of Mathematics at Prairie View A&M University. The author of numerous research papers and three books coauthored with Dr. Haghighi, Dr. Mishev's areas of research interest include differential and difference equations and queueing theory.